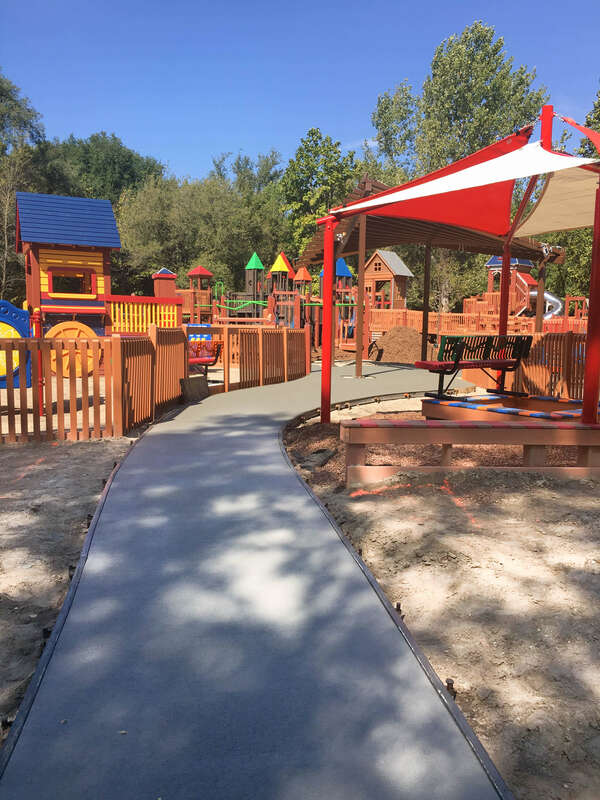 This post provides an overview of Council Bluffs’ community efforts to update and enhance a playground at Lake Manawa State Park with a focus on all-inclusive play and ADA compliance. 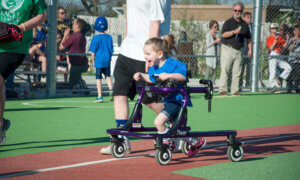 Council Bluffs is now home to the largest public ADA accessible playground in the state of Iowa featuring a variety of all-inclusive equipment geared toward different development levels and physical abilities. 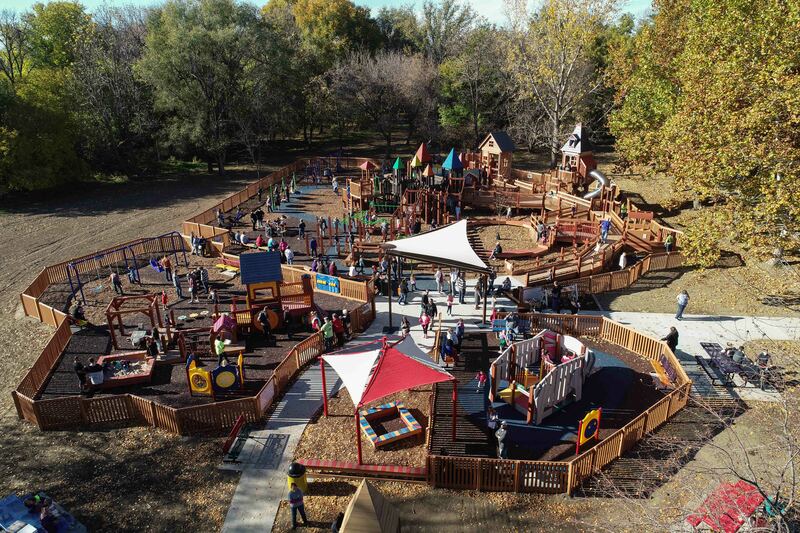 Through extensive community input and collaboration, the Council Bluffs’ Dream Playground Re-Imagined project successfully revitalized a park originally built in August 1993. At-grade equipment provides easy access for all users. Located in Lake Manawa State Park, the original playground structure was made primarily of wood, which has deteriorated over time creating safety hazards. A sand surface covering the majority of the playground and outdated equipment limited accessibility for individuals with mobility challenges. Recognizing the playground had exceeded its design life and fell short of meeting the community’s needs, plans to rebuild were announced in November 2016. Rubberized surfaces with accessible benches, conga drums, a shaded area, and more. Accessible ramps, bridges, swings, activity panels (abacus, alphabet, tick-tac-toe), a sandbox, and railroad jungle gym. Accessible telescope, gymnastic and monkey bars, activity panels (maze, sign language, clock, braille, etc. ), swings, instruments, see-saw, slides, a merry-go-round, and more. The Iowa Western Community College Cheer Team poses for a group photo while volunteering during playground construction. Hunter notes that all-inclusive experiences, such as those fostered by the Dream Playground Re-Imagined and Ames Miracle League Field, are an essential component of social equality and community livability. As the name implies, Council Bluffs’ Dream Playground was inspired by the dreams and desires of children in the community. To “re-imagine” the park, Council Bluffs turned to community youth once again in 2017 with over 1,700 children submitting drawings of their dream playground. Inspired by the children’s drawings and the area’s rich history, the final design was created by Play by Design and presented to the public in April 2017. It honors important historical components such as the Union Pacific Railroad and the Lewis & Clark trail, which guided early pioneers through the area. In addition, iconic, pointed rooftops of elevated structures on the original playground are being restored and reused as a way of paying homage to children that contributed to the project in 1993. 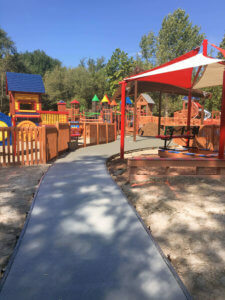 A concrete path leading to playground equipment accommodates individuals with mobility challenges. Council Bluffs’ Dream Playground was made entirely possible through the generous support and assistance of community volunteers. 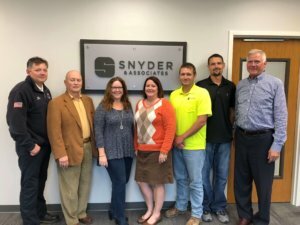 Recognizing the renewed need for community participation, Class 30 of Leadership Council Bluffs adopted the Dream Playground Re-Imagined as its Community Trustee Project. With each member of the class serving on one of eight project committees, everyone was able to participate in a way that utilizes their personal and professional strengths. “Each member of the class brings different strengths to the team,” says Hunter, member of Leadership Council Bluffs Class 30 and chair of the Dream Playground Re-Imagined Volunteer Committee. 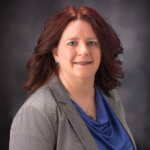 As a team member, Hunter spearheaded one of the most critical components of the project, while utilizing her professional skills and experience. Construction of the new playground was scheduled to occur in two phases, but due to weather-related delays and volunteer availability, a third phase was added. Phase 1 — Placement of playground posts and preliminary work to prepare playground equipment assembly. Phase 2 — Partial assembly of playground equipment. Phase 3 — Finished construction and assembly of playground equipment, along with surfacing, fence construction, grading, and mulching. Volunteer recruitment and fundraising were essential components of project success. Playground construction was set up in an assembly line format with specific tents for equipment, building, and assembly. A children’s activity tent provided a safe, supervised place for children to play while their parents volunteered. Barry Cleaveland, a member of the Dream Playground Steering Committee and head of fundraising for the project, estimates that the combined value of cash donations, in-kind services, and volunteer hours exceeds $1.3 million. After two years of planning and hard work on behalf of Leadership Council Bluffs Class 30 and community volunteers, a grand opening and ribbon-cutting celebration took place on Sunday, October 28, 2018. During the event, leftover supplies and building materials, along with birdhouses built from scrap wood and playground composite, were sold during a silent auction that raised approximately $1,700 for an endowment fund for future maintenance. As a result of the project, Hunter says several volunteers have expressed a desire to continue working together in the future on additional community-based projects, including one to create a new trailhead for an existing trail in the area.